Mentioned is the way you can write Gaming/Casino Surveillance Officer CV Template. 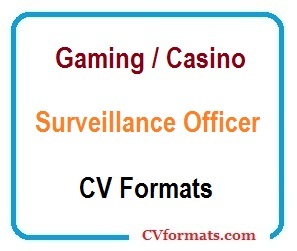 People looking for jobs can easily download these Gaming/Casino Surveillance Officer CV formats in editable pdf and MS-Word (.doc) formats or you can just copy and paste from or website CVFormats.com and app. Cover letter of Gaming/Casino Surveillance Officer CV Template is also available. Just change the name , address , qualification and experience and your Gaming/Casino Surveillance Officer CV Template is ready. 2010 – Present: Assistant Procurement Clerk, Oxford Casino, Ltd. Implement safety and protection rules for casino quests, employees and casino property in accordance with policies and laws. Monitor casino operation as well as entrance and exit point, high value locations and critical areas. Monitor patron activities for signs of cheating or theft. Occasionally make the rounds in the casino floor to mingle with the patrons and casino dealers and operators.. Coordinate with local police authorities for confirmed sightings of theft. Subdue untruly guests and detain alleged thieves until the law enforcement officials arrive for turnover. Have the patience and an observant eye to spot unusual activity on the monitor screen. Physically fit with quick reflexes. Excellent computer literacy in operating surveillance systems.